In previous blog, we started with brief introduction of docker platform and also saw how to build images and run containers. 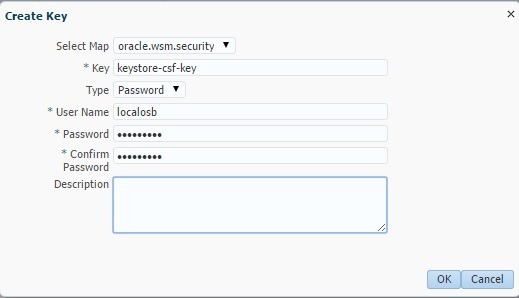 In this blog, we will see how to setup an Oracle SOA Suite 12.2.1.3 environment with docker containers using Oracle official docker images. The README files available with official images have lot of information and one could easily create the docker images. So i just want to collate all this information here for quick reference. I used Ubuntu 17.10 (artful) VM with docker version 17.12.1-ce in Windows 10 based laptop. 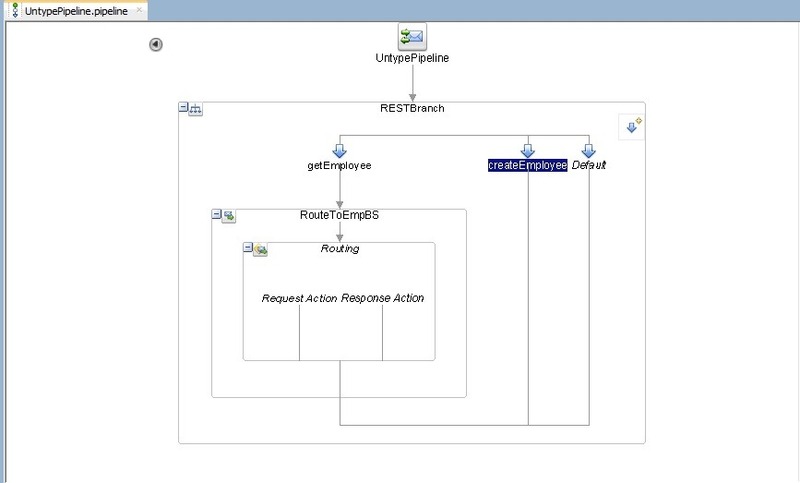 Install Oracle SOA Suite/BPM Suite/OSB as per requirements. In the world of docker the above steps translate to the following steps. To start with, download official dockerfiles from https://github.com/oracle/docker-images and we use docker images related to OracleJava, OracleDatabase, OracleFMWInfrastructure and OracleSOASuite. Each of these folders have necessary scripts for installation but does not contain executables. Have all these folders copied into docker-images directory. 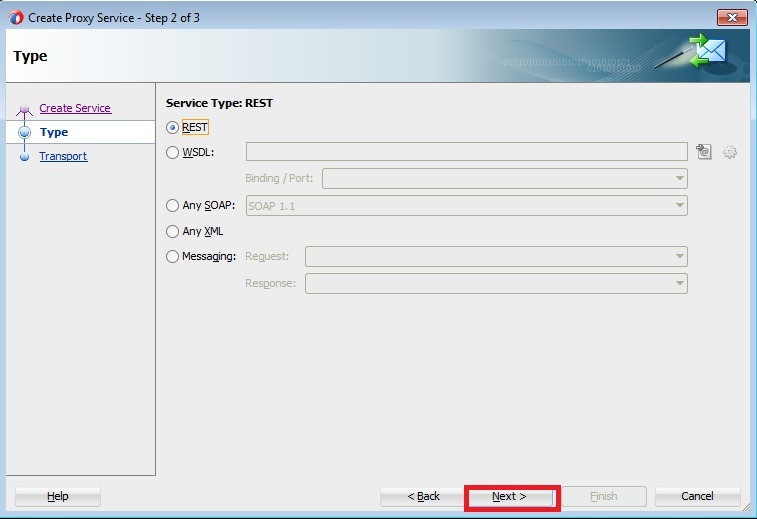 Download server-jre-8u161-linux-x64.tar.gz from link and copy into directory OracleJava/java-8. Navigate to the above directory and run sh build.sh. 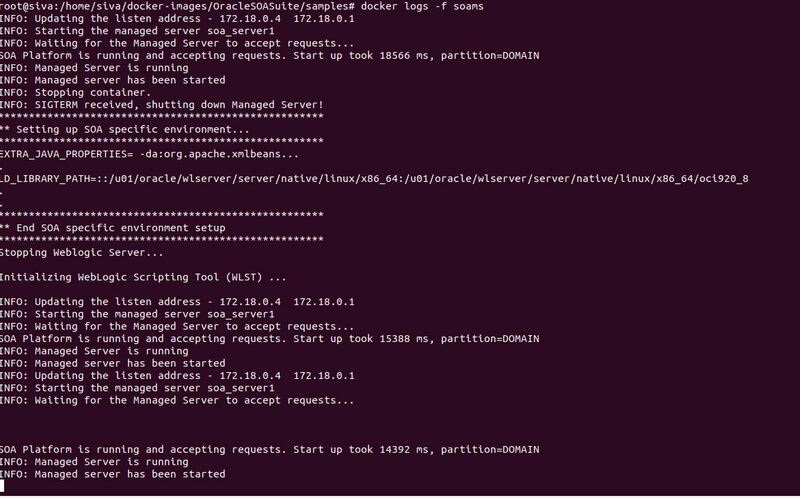 We will observe the docker image oraclelinux:7-slim getting pulled from docker hub as the docker file contains instruction FROM oraclelinux:7-slim. 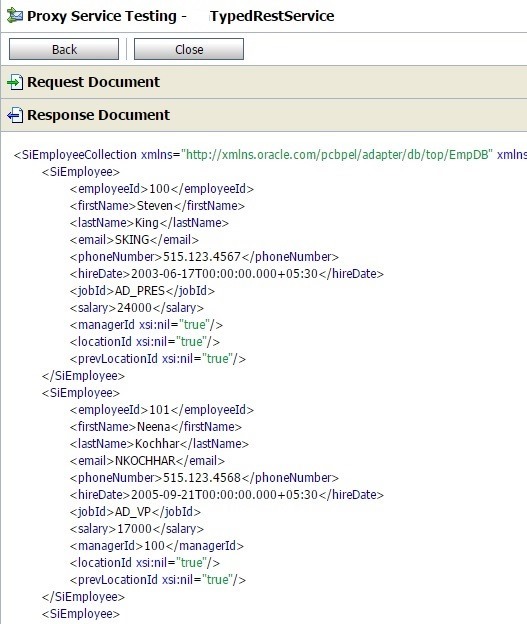 Once the build is complete we can see a new image available with tag oracle/serverjre:8. Note that OracleJava folder also have docker files required to build JRE 9. Download files linuxamd64_12102_database_1of2.zip and linuxamd64_12102_database_2of2.zip from link and copy into directory OracleDatabase/dockerfiles/12.1.0.2. I had used 12.1.0.2 version though the latest is 12.2.0.1 because of smaller size. Navigate to the directory OracleDatabase/dockerfiles and issue the following command. 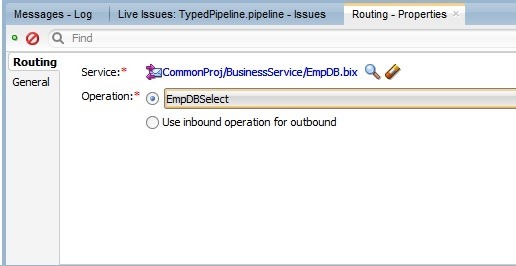 Option -v indicates the db version and the option -e represents Enterprise Edition. Open OracleDatabase/dockerfiles/12.1.0.2/Dockerfile.ee to check the instructions that get executed during the image build. Observe oraclelinux:7-slim as the base image in this docker file. 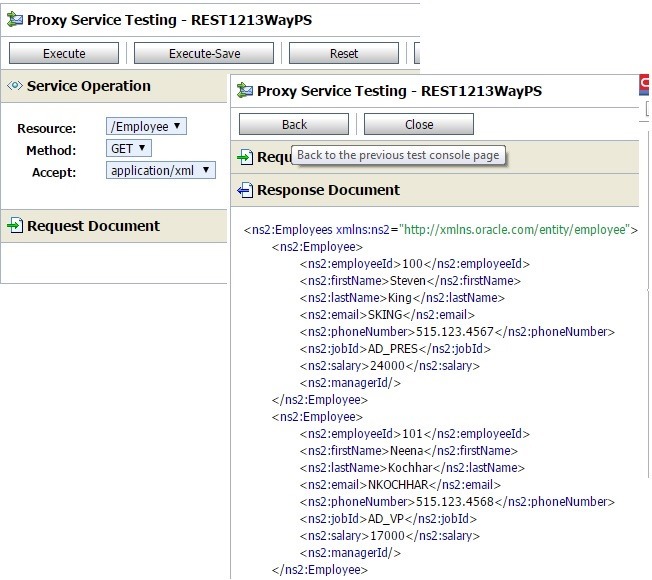 Once the build is complete we can see a new image available with tag oracle/database:12.1.0.2-ee. Note that OracleDatabase folder also have docker files required to build images based on versions 12.2.0.1 and 11.2.0.2 (XE). Download file fmw_12.2.1.3.0_infrastructure_Disk1_1of1.zip from link and copy into directory OracleFMWInfrastructure/dockerfiles/12.2.1.3. Navigate to the directory OracleFMWInfrastructure/dockerfiles and issue the following command. Option -v indicates the version. Open OracleFMWInfrastructure/dockerfiles/12.2.1.3/Dockerfile to check the instructions that get executed during the image build. 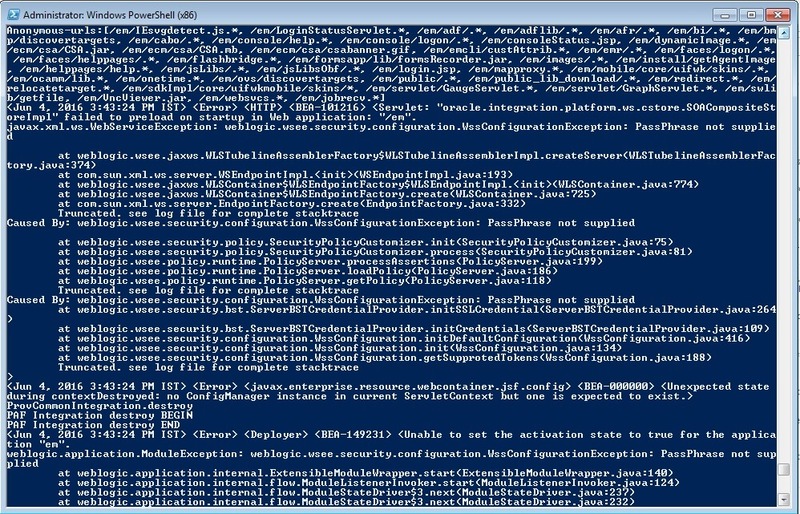 Observe that oracle/serverjre:8 is the base image and this is the exact reason why we built jre image first. 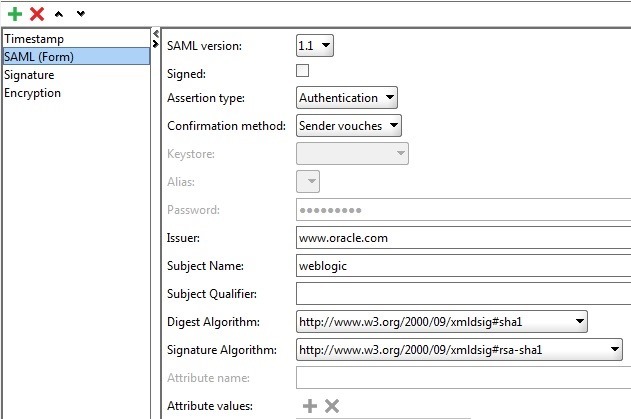 Once the build is complete we can see a new image available with tag oracle/fmw-infrastructure:12.2.1.3. Note that OracleFMWInfrastructure folder also have docker files required to build images based on versions 12.2.1.2. 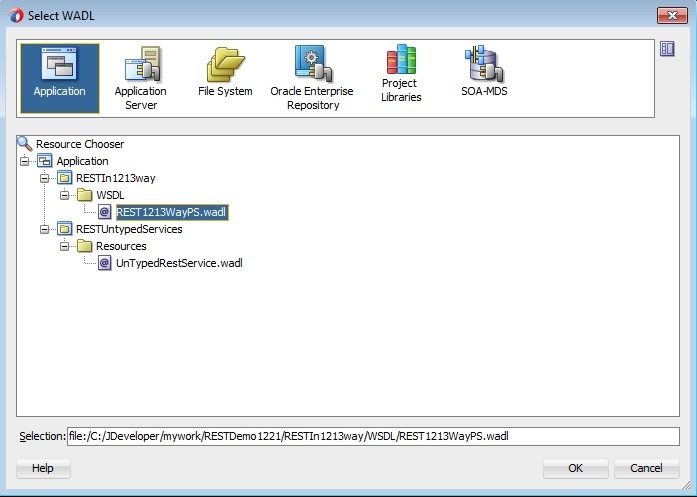 Download files fmw_12.2.1.3.0_soa.jar and fmw_12.2.1.3.0_osb.jar from link and copy into directory OracleSOASuite/dockerfiles/12.2.1.3. Note that these installers are not quick start installers. Navigate to the directory OracleSOASuite/dockerfiles and issue the following command. Option -v indicates the version. Open OracleSOASuite/dockerfiles/12.2.1.3/Dockerfile to check the instructions that get executed during the image build. Observe that oracle/fmw-infrastructure:12.2.1.3 is the base image and this is the exact reason why we built that image first. 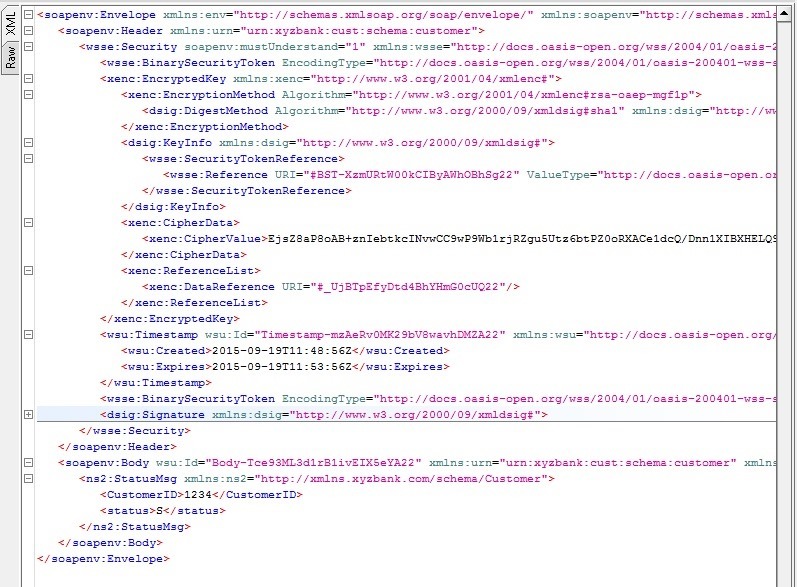 Once the build is complete we can see a new image available with tag localhost/oracle/soasuite:12.2.1.3. Note that OracleSOASuite folder also have docker files required to build images based on versions 12.2.1.2. 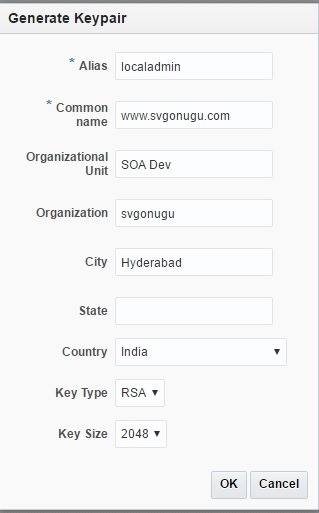 By creating docker images for DB and SOA Suite, we are done with the installation and yet to configure DB instance, run RCU and configure SOA/OSB domain. 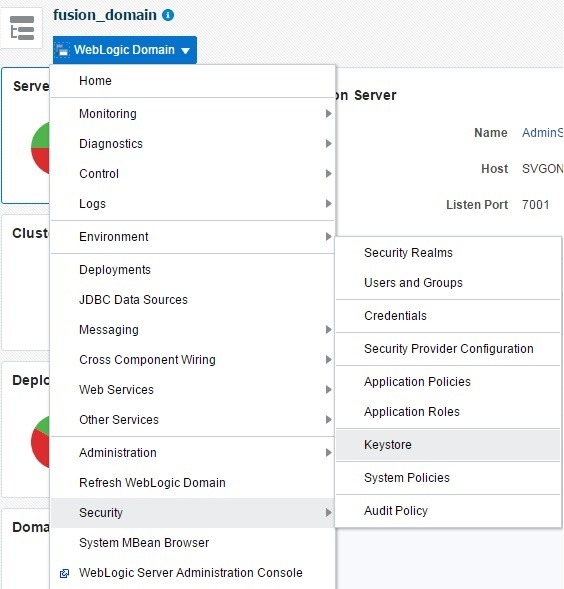 Note that the image oracle/fmw-infrastructure has one pre-configured domain named base_domain. We use docker-compose tool to create containers based on the above images. A sample yaml file docker-compose.yml is located in OracleSOASuite/samples directory. Edit ../setenv.sh and set or modify the required env variables and do source ../setenv.sh. 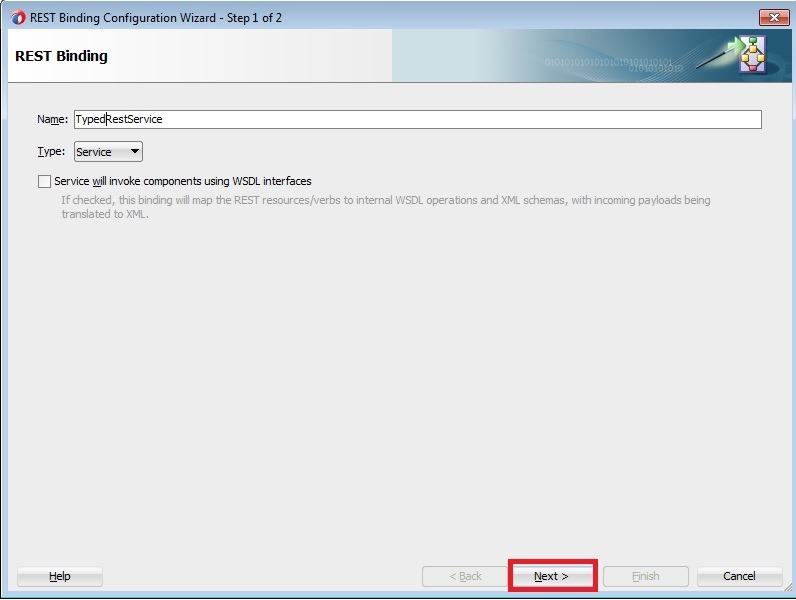 At minimum, we need to set DC_ORCL_SYSPWD, DC_ADMIN_PWD and DC_RCU_SCHPWD. Note that i had to set DC_HOSTNAME to ip address like 172.18.0.1 instead of hostname and localhost. Do this as first step before starting up any of the containers below. Use command docker-compose up -d soadb to start the db container. When DB container starts for first time, it configures the DB instance, TNS listener and creates some dummy password for SYS user. The logs can be seen using command docker logs -f soadb. Execute docker exec <<container id>> /opt/oracle/setPassword.sh <<pwd>> to reset password for SYS user. Make sure that DB container is running before executing this command. 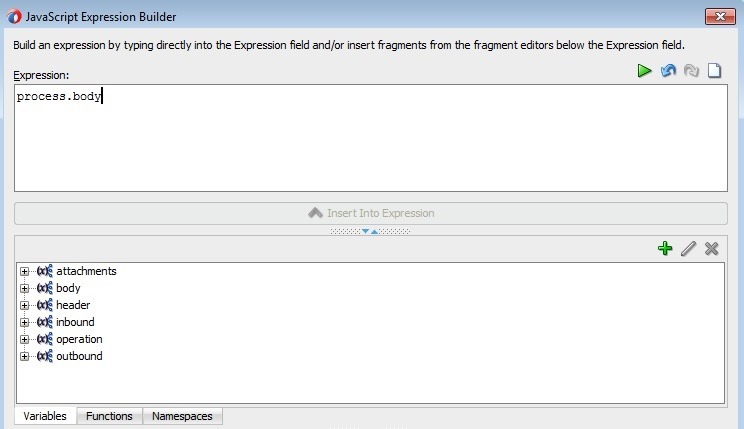 The location of this script file can be derived from the instructions found in OracleDatabase/dockerfiles/12.1.0.2/Dockerfile.ee. After the first time, to restart the container we can use either of the below commands. Make sure to run source ../setenv.sh always before using docker-compose commands. 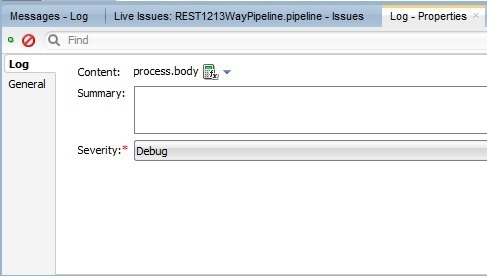 Connect to db using command sqlplus sys/fusion@//172.18.0.1:1521/soadb as sysdba to make sure that DB is up and running. Command docker stop can be used to stop the container. docker-compose.yml file has soaas as one of the services which can be used to create the container. Use command docker-compose up -d soaas to start the admin server container. 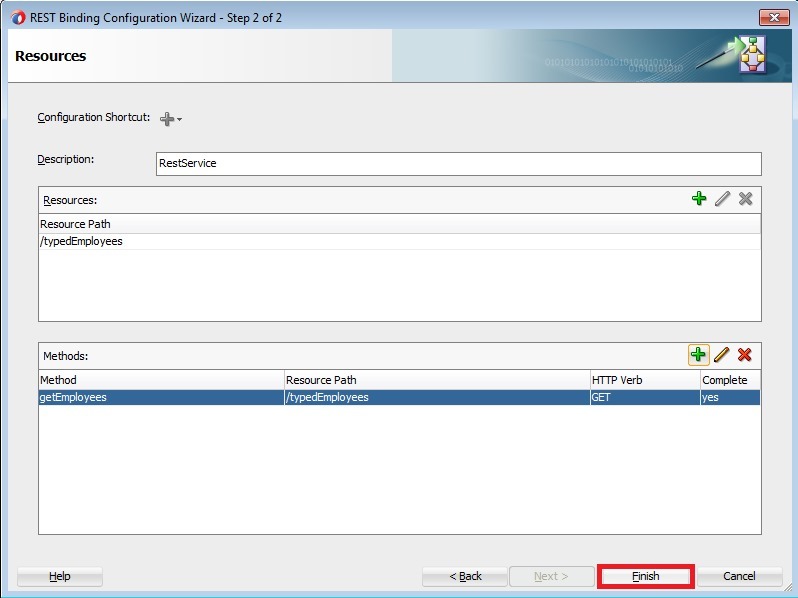 When admin server container starts for first time, it runs RCU to create the required schemas by connecting to db container and also configures a new domain ,. 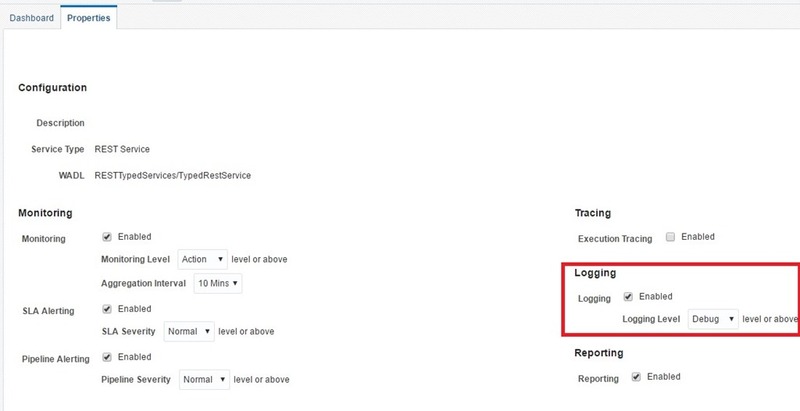 The logs can be seen using command docker logs -f soaas. Verify you are able to access admin console using http://localhost:7001/console and observe that AdminServer is up and running. 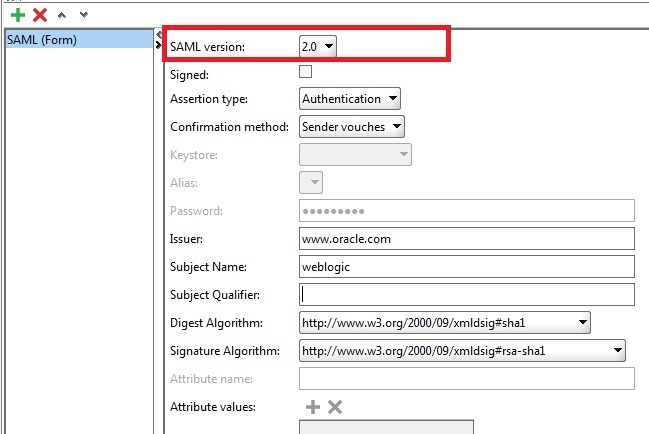 The password for admin console will be the value given for DC_ADMIN_PWD in setenv.sh. In data sources, observe that prefix SOA01 is used for SOAINFRA, MDS and others which is the value given for DC_RCU_SOAPFX in setenv.sh. Note that i had to use minimum 6 GB RAM for my ubuntu VM to bring DB, Admin and managed server containers. docker-compose.yml file has soams as one of the services which can be used to create the container. Use command docker-compose up -d soams to start the managed server container. 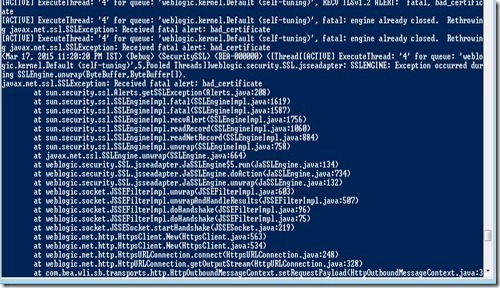 The logs generated in managed server container can be seen using command docker logs -f soams. 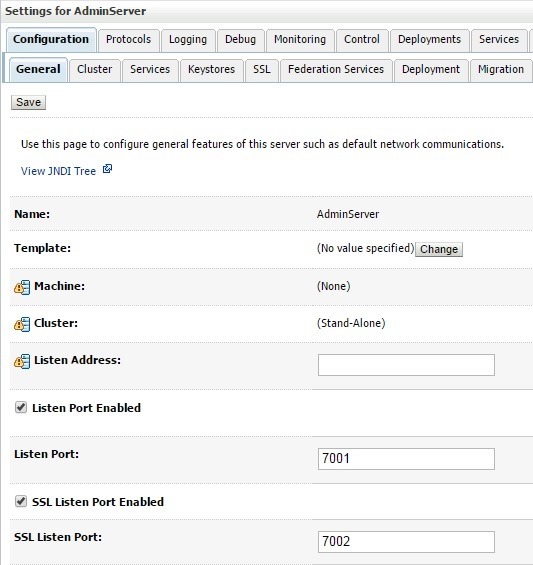 Access admin console using http://localhost:7001/console and observe that soa_server1 is up and running and also we can see a soa_cluster configured. 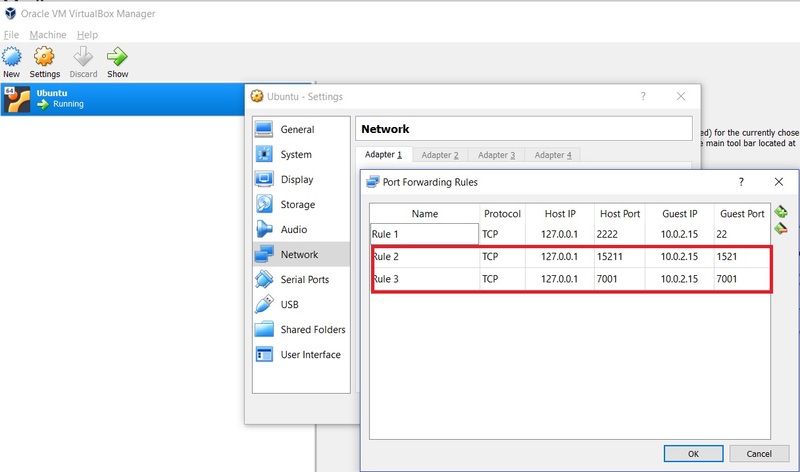 If we want to access the admin console from host OS, we need to configure the port forwarding rules for the VM as shown below. 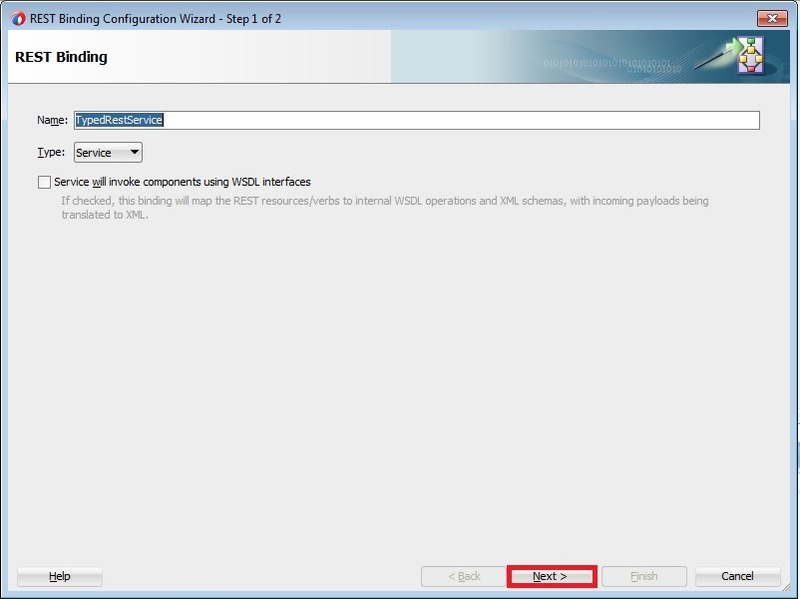 When we are installing DB or SOA Suite in laptop the installation wizard guide us through the steps which makes life easier. But when when we want to use docker files to build images we need to come up with script for the installation and configuration. Typically developer may not have this much acquaintance with these kind of installation scripts and i feel admin help is required. I hope Oracle keep updating the their github repository with newer docker files and scripts whenever a new release is available. I feel debugging containers is difficult and need to look more into this aspect. Initially, when i created VM i used 3 GB RAM and with this RAM i was able to bring up DB and Admin server container. But when i starting managed server it got stuck and docker logs also did not help me to identify this issue. It was a complete guess by me and increased the RAM to 6 GB which made the things smoother. The docker files uses yum tool which is not available in ubuntu that means, we may need to come up different docker files for different linux distributions and for Windows OS. 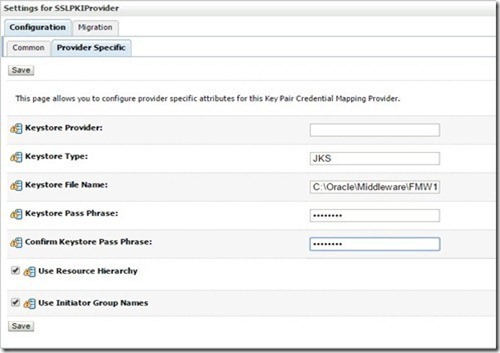 The oracle official docker images for Java, DB and FMW Infrastrcture has oraclelinux as the base image. Does that mean oracle does not support in other linux distributions like ubuntu etc. I need to check on this and i welcome readers to let me know if anyone has information on this. 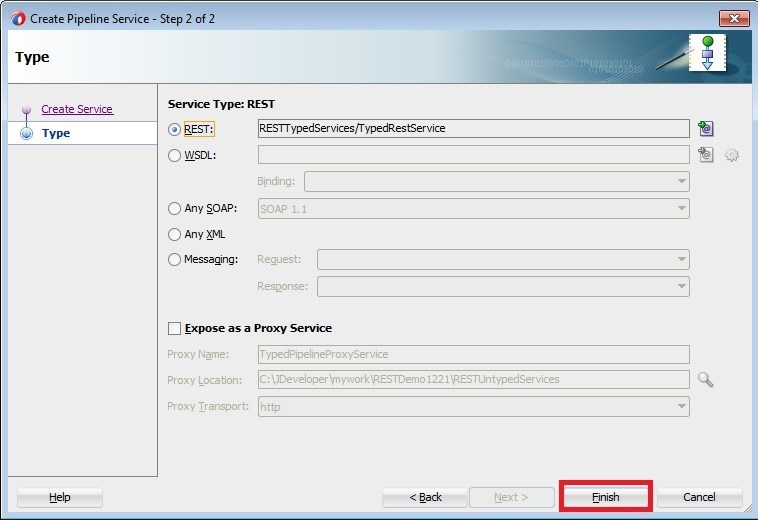 In this blog, we will review native REST service support added in 12.2.1. And you can refer to post to find information about same from 12.13 perspective. Before discussing further, we will first see how 12.2.1 provides the backward compatibility with 12.1.3. 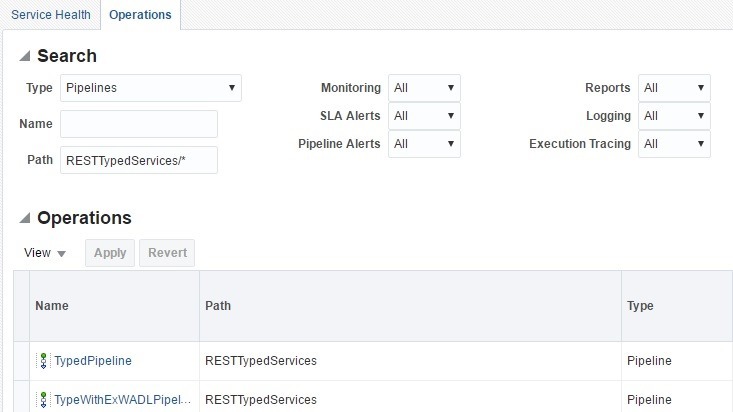 In 12.1.3, REST Proxy Service converts native REST payload to SOAP before calling a Pipeline/Split-Join and REST Business Service convert SOAP to REST native payload i.e. 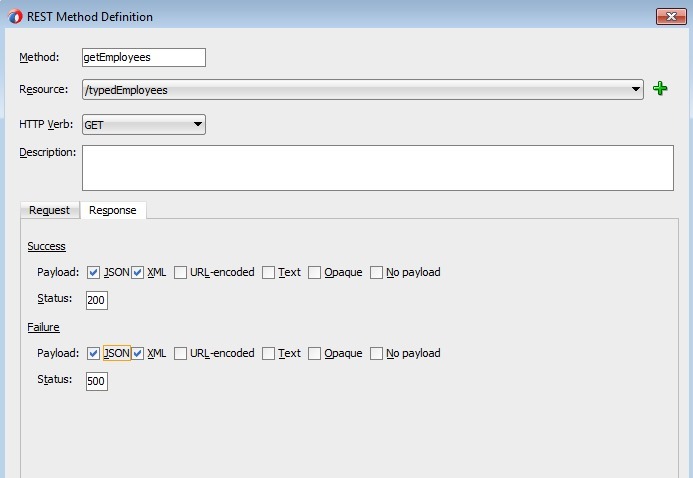 the internal communication happen using WSDL interfaces only. 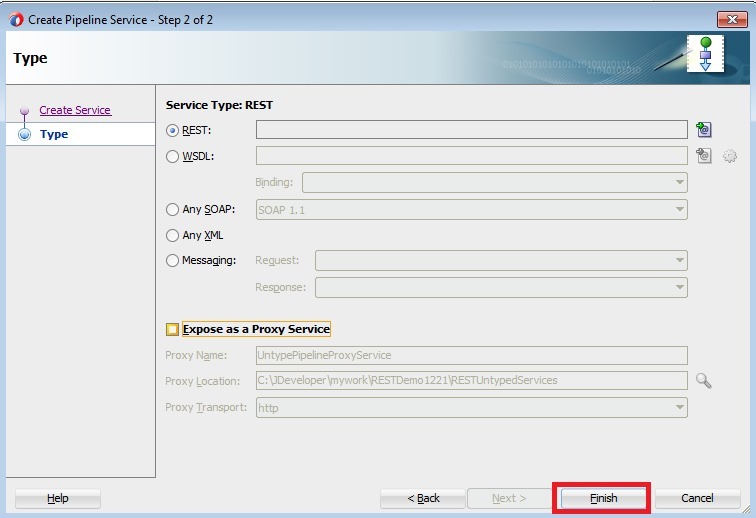 In 12.13, while creating REST binding as Proxy or Business service check the option as shown below and other steps remain same. 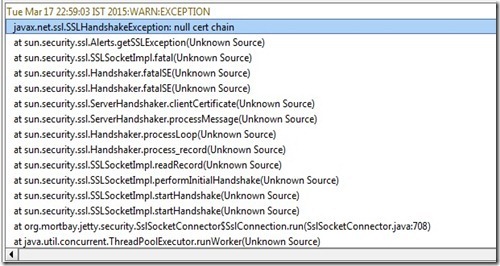 We can see WSDL and WADL gets created in your project. Un-typed Proxy/Business Service – For which method information is available at design time so no WADL is involved. 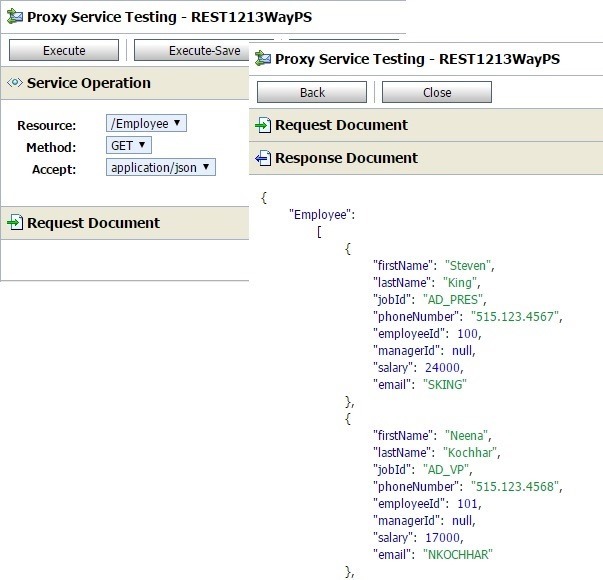 Typed Proxy/Business Service – For which the method information is available at design time so WADL is used/created having this information. 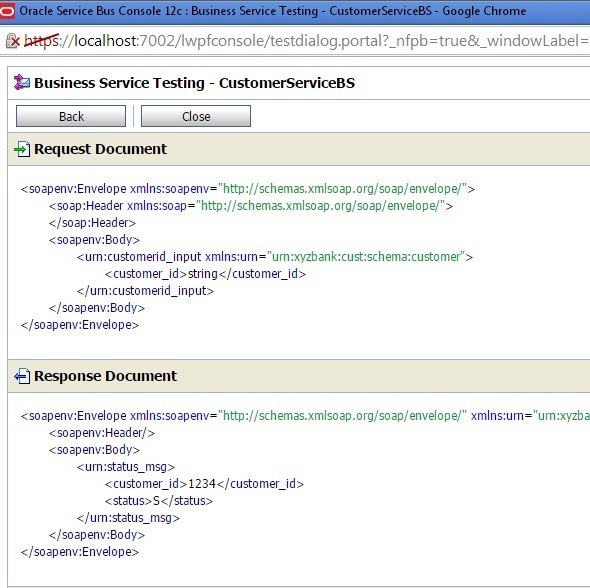 REST binding can be used to create both Proxy and Business services that fall into above categories. In this post, we discuss from Proxy Service perspective and same can be followed for business services. We use REST binding to create native REST service. 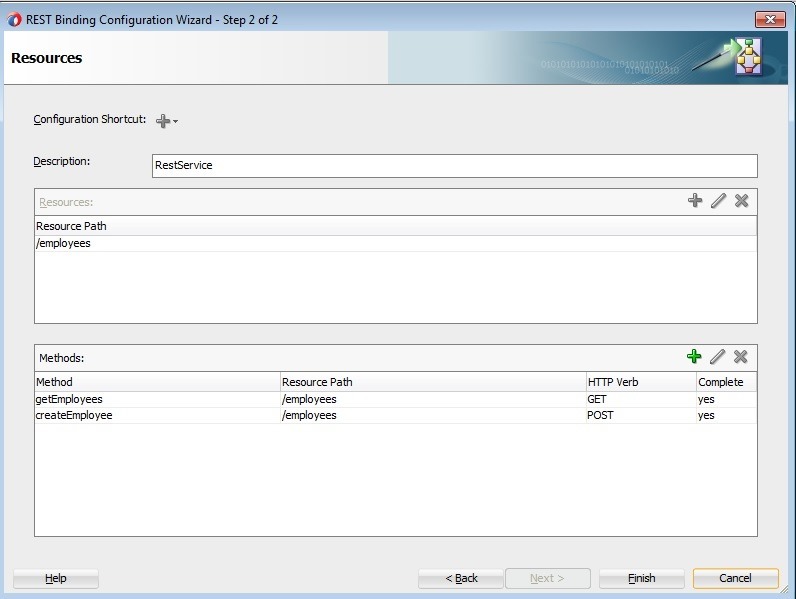 So drag REST binding from Components to Proxy Services swim lane or right click to choose REST option. 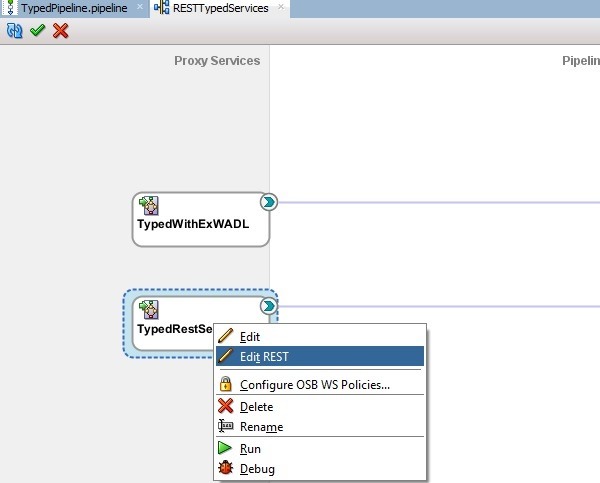 Provide name for REST binding and do not select WSDL interfaces check box as we are creating native REST services. Click Next. 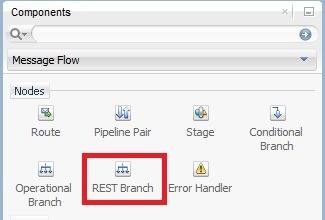 Create a new REST resource as shown below. 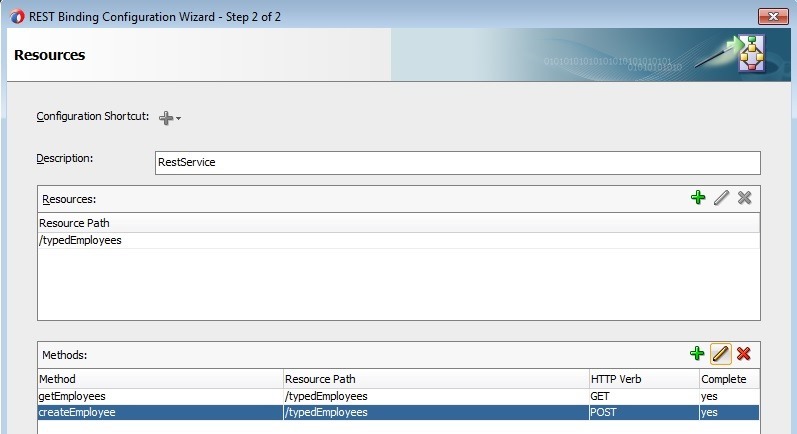 Create a REST method using following steps by clicking + icon in Methods. Now verify that WADL file is generated automatically with method information as defined above. 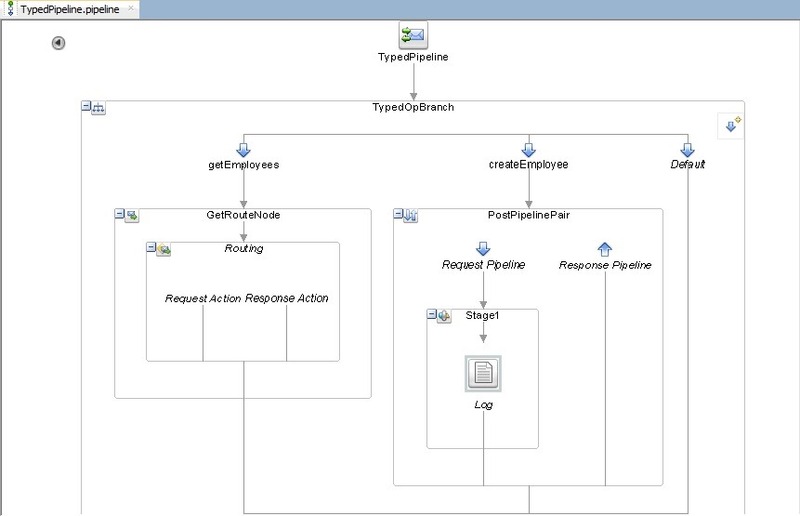 Now create pipeline using the following steps. 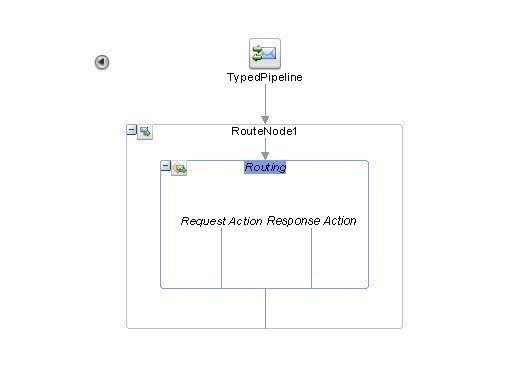 Connect Proxy Service, Pipeline and Business Service as shown below. Use the same business service as we used earlier. Finish the message flow as shown below. 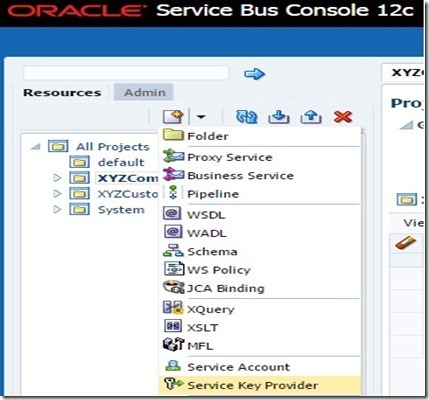 Deploy and test your project in Service Bus console. 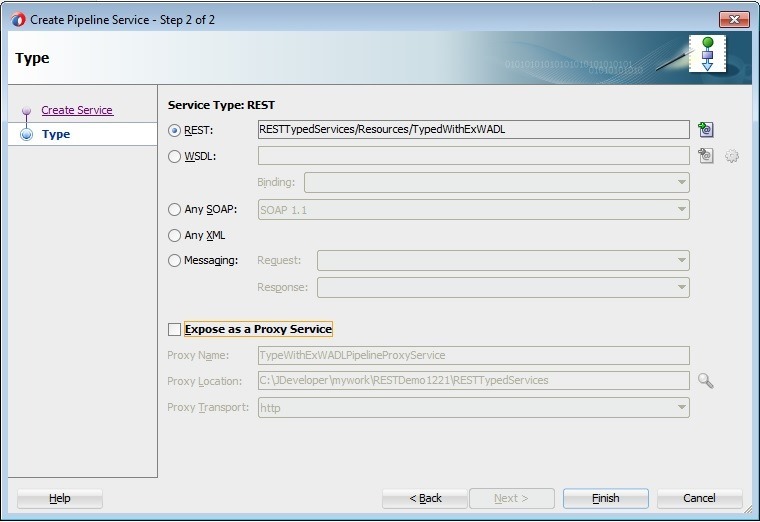 Observe that you can see all media types supported by REST service are shown in Accept choice list. 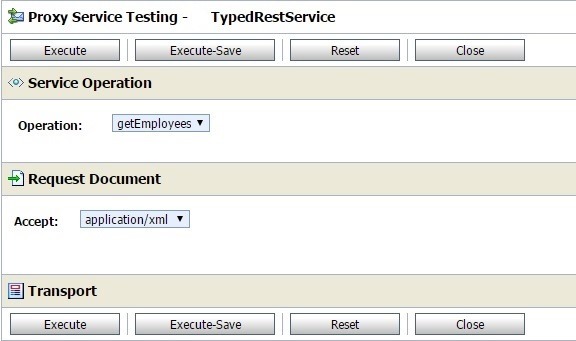 Now we will see how to use an existing WADL to create Typed REST services. 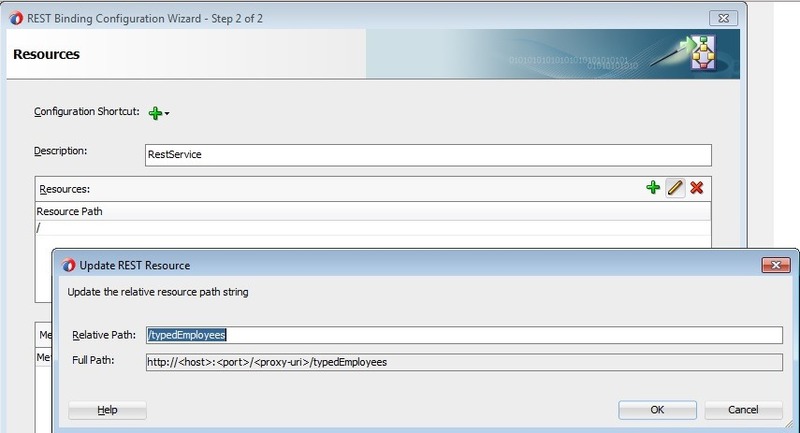 Again drag the REST binding from Components to Proxy Services swim lane or right click in swim lane to choose REST option. Choose REST1213WayPS.wadl. 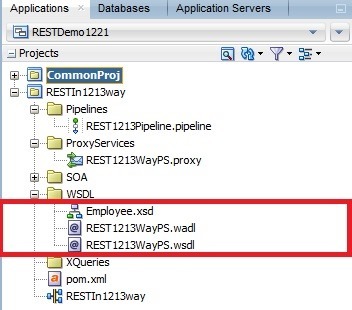 This confirms that WADLs generated by 1213 REST services are supported here. 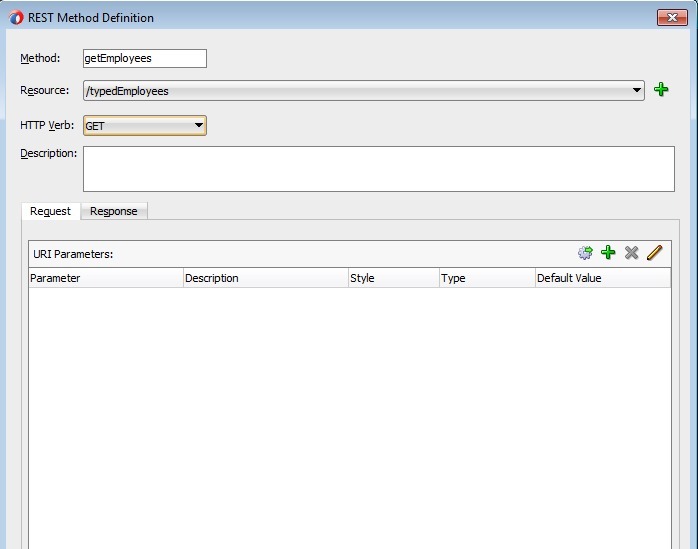 Observe that REST methods are populated automatically from selected WADL. Click Finish and verify that new WADL is generated again for this Proxy Service. 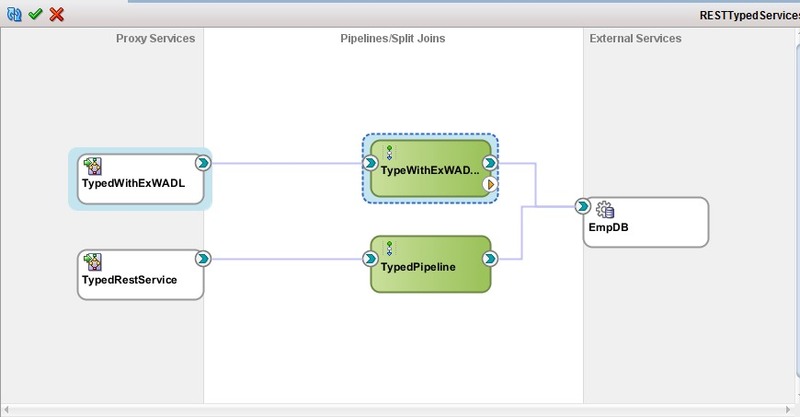 Now finish pipeline message flow as above using WADL created in above step. WADL is always created for Typed native REST services when one is not chosen during creation. 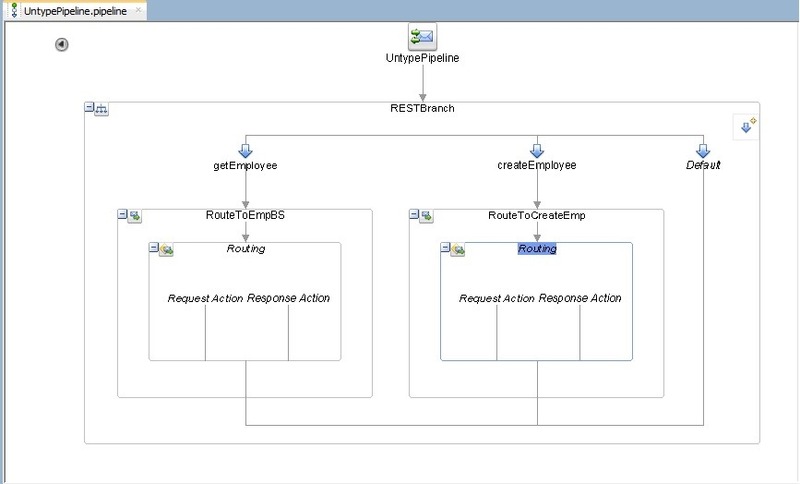 No where we are able to give the input/output message structure (XML or JSON schema) for REST methods. I think this may be improved in later releases. 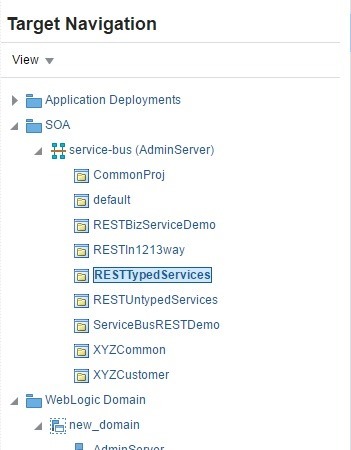 When a native REST Proxy Service supports multiple content types (XML, JSON), automatic payload conversion (XML to JSON and vice-versa) is not happening as we see in WSDL based REST services. I will try to cover more on this in later posts. 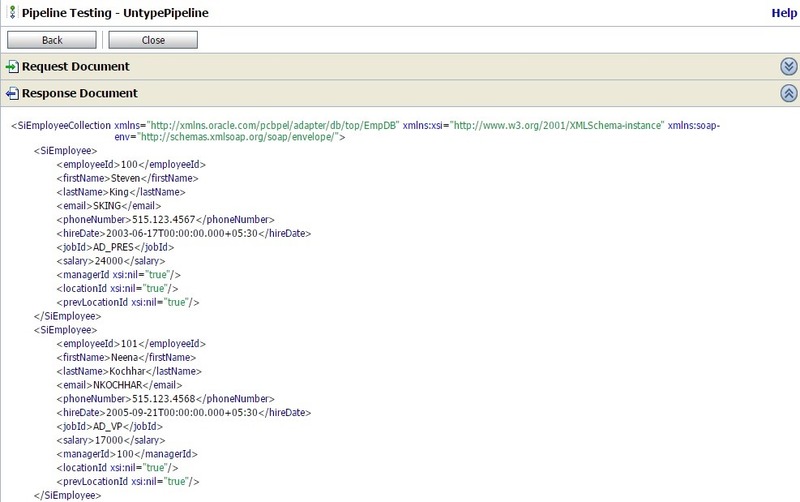 Value given for soa:name in WADL is populated for $operation context variable in pipeline. 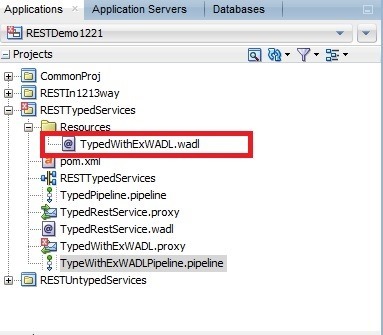 1213 WADL is not supported for creating pipelines but can be used to create Proxy, however a new WADL will be generated by OSB as we saw above. 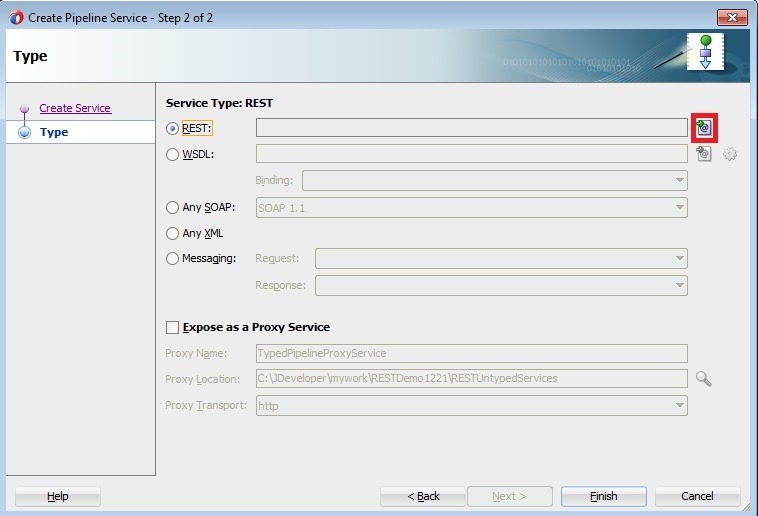 Create a Proxy Service using following steps. Observe the usage of Transport and no where we define REST resource or methods. 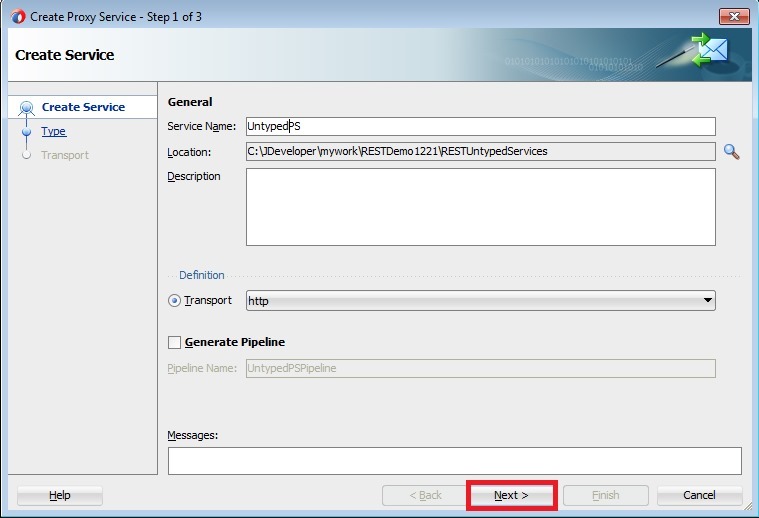 Create pipeline using following steps and observe that we are not selecting any WADL as we did earlier. Connect all these pieces as shown below and complete Message Flow as we did earlier. 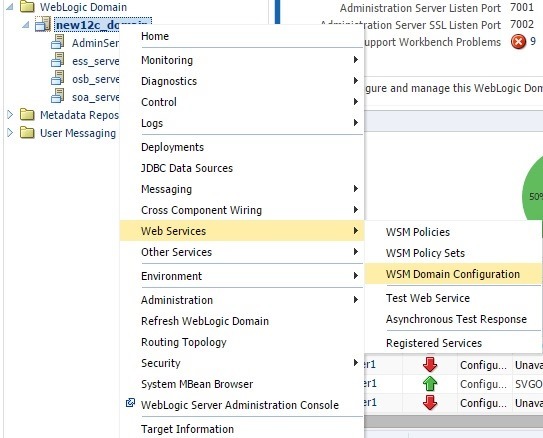 Deploy and test your project in Service Bus console. 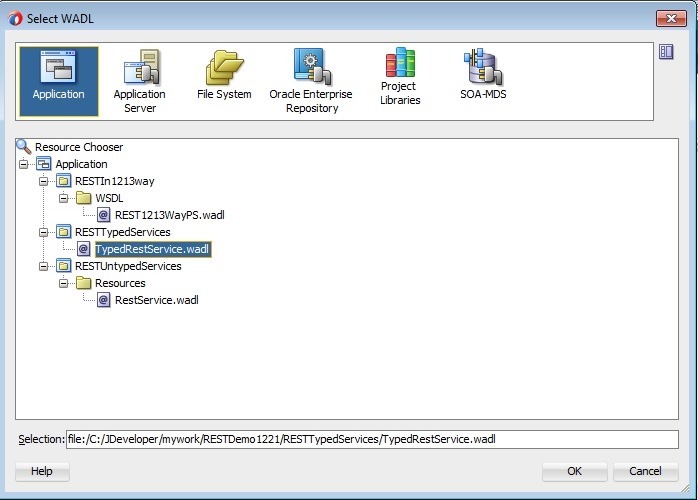 Observe that you can see all media types supported by REST service are shown in Media Type choice list as we have not specified supported types any where. 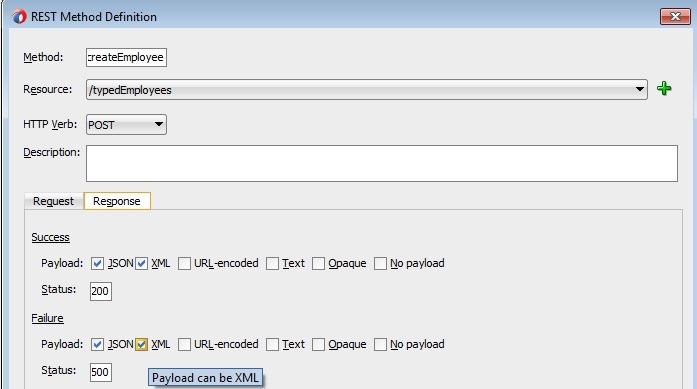 Service Bus uses the Content-Type HTTP header for parsing the payload and you can see this is set automatically when we choose the media type in Test Console. No WADL is used during creation of Un-typed native REST services. 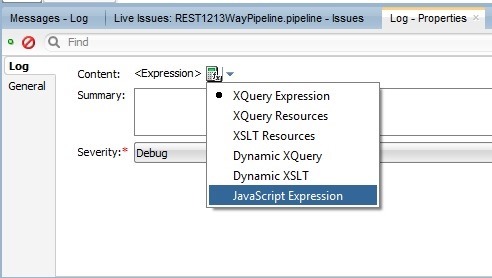 Again, no where we are able to give the input/output message structure (XML or JSON schema) for REST methods. 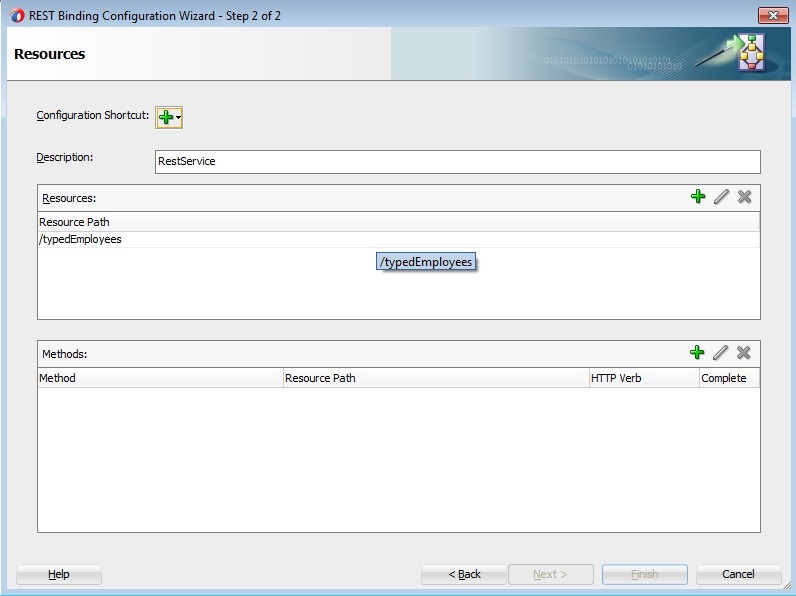 Again, no automatic payload conversion will happen when REST Proxy supports multiple Content Types. 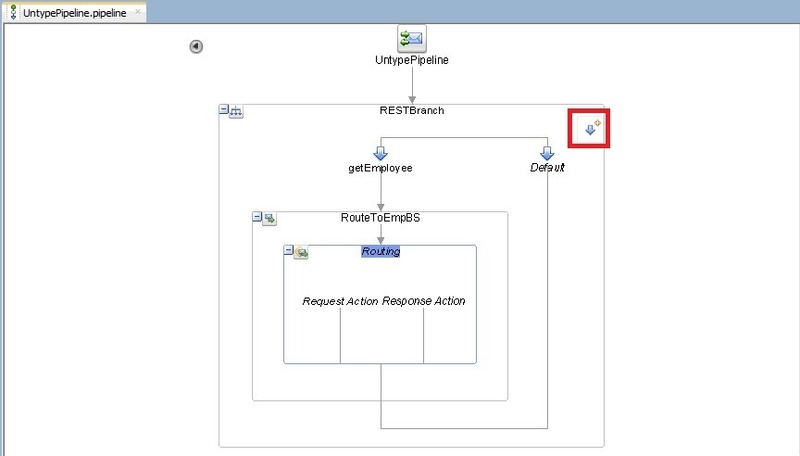 In above 2 sections, we created both Proxy and Pipeline separately and we can observe that WADL is optional for REST based pipelines. 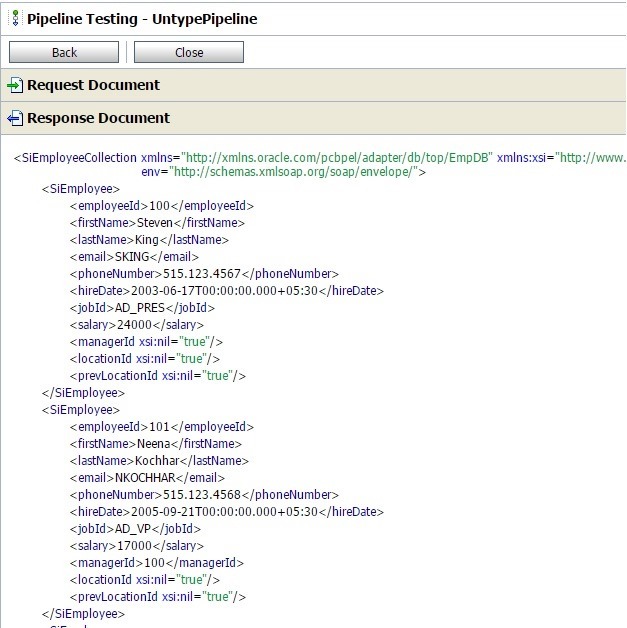 So even Pipelines are classified into Typed and Un-typed depending on usage of WADL. 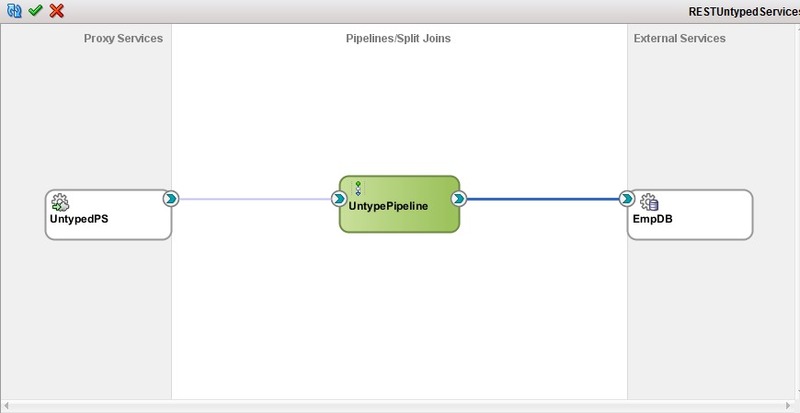 So now the Q arises about compatibility between Proxy and Pipelines as both of them can be Typed /Un-Typed. Since Typed is more restrictive having REST methods we will be able to call both Un-Typed and Typed pipelines provided they used same WADL. 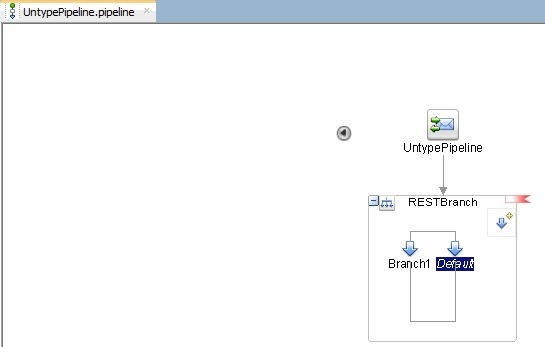 In the same way, Un-Typed will be able to call both Un-typed and Typed Pipelines. 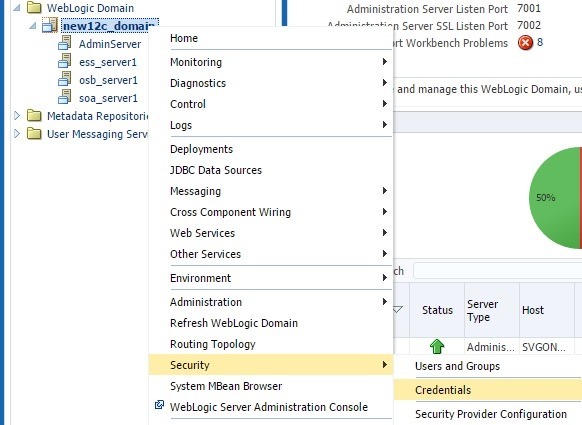 The source code used in this post can be downloaded from here and please note that you need to create DB connection pool to run this project with JNDI eis/DB/LocalDB. The following information is related to 12.2.1 release unless stated otherwise. 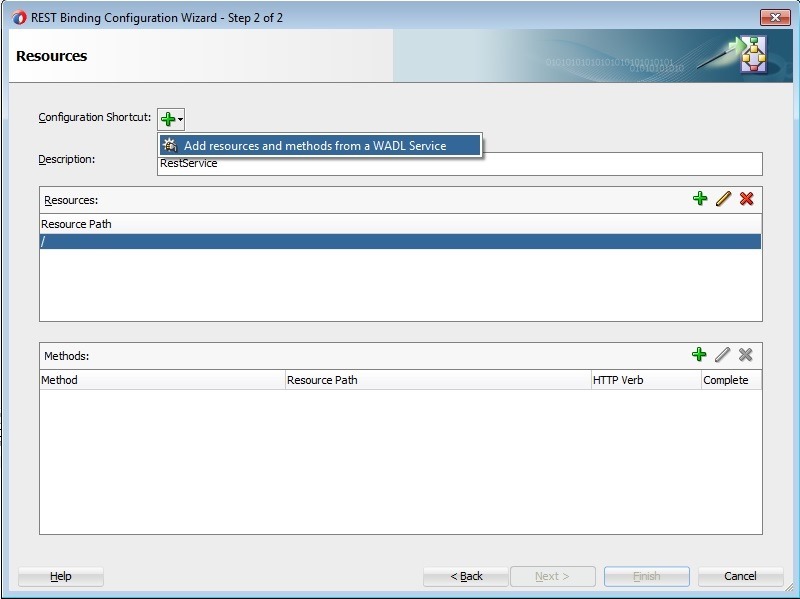 OSB projects are being converted to SOA projects after adding a XQuery to workspace. 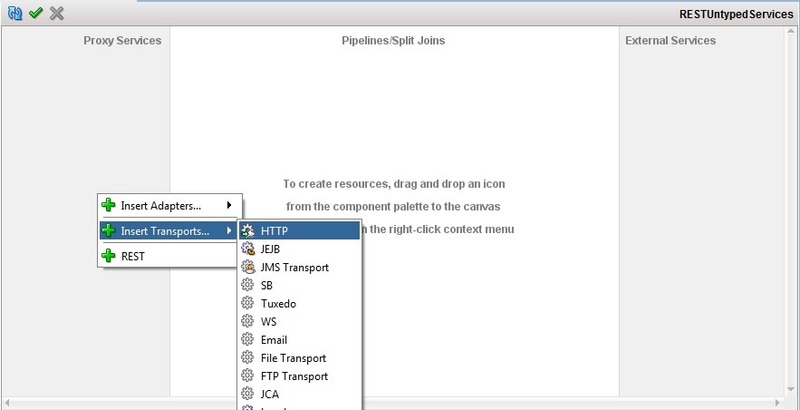 You can confirm this by looking at components window which shows SOA related components after opening a pipeline. Fortunately, this issue is already documented by in support note 2090174.1 and the solution is applying the patch 22226040. Refer to this post for instructions on applying the patch. 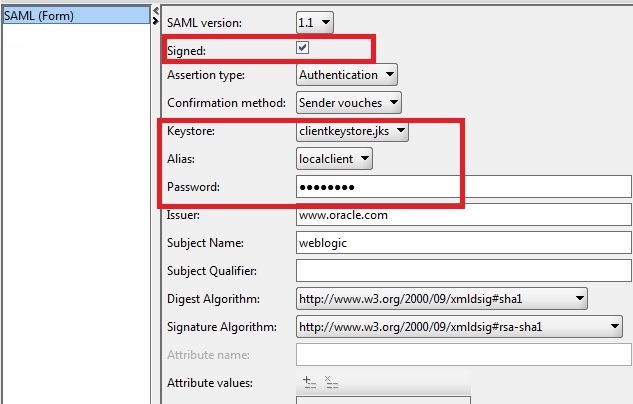 Make sure that ORACLE_HOME and MW_HOME are pointing to right locations when you have multiple middleware homes. Verify that patch is successfully applied by issuing opatch lspatches. 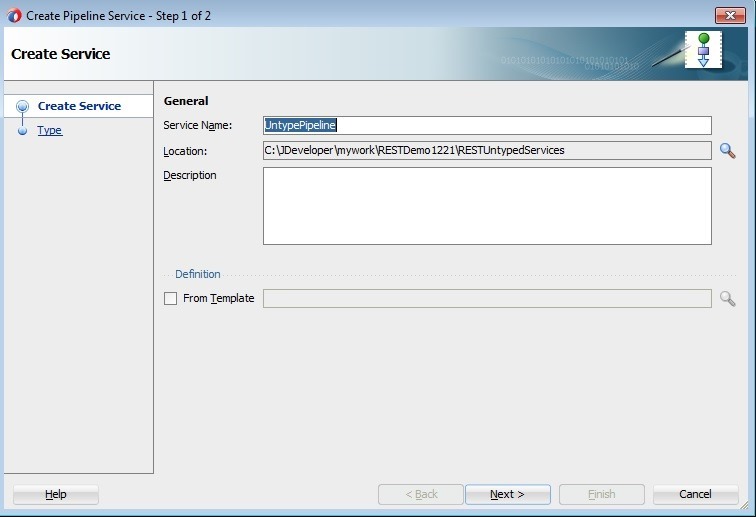 Restart jdeveloper after clearing the cache (system directory). 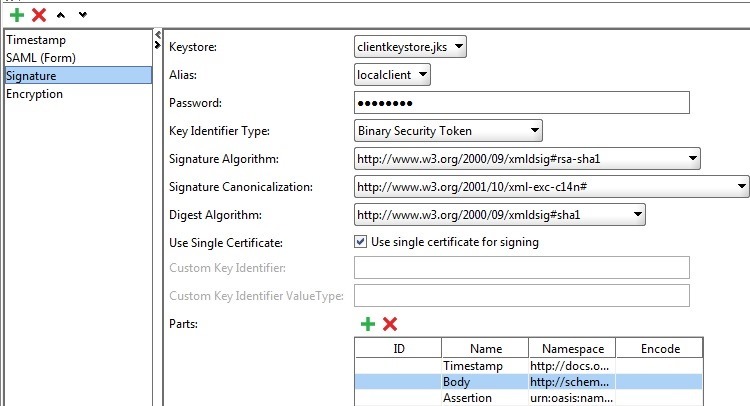 If you still see this issue, verify the jpr files TechnologyScopeConfiguration does not have SOA entry similar to below. 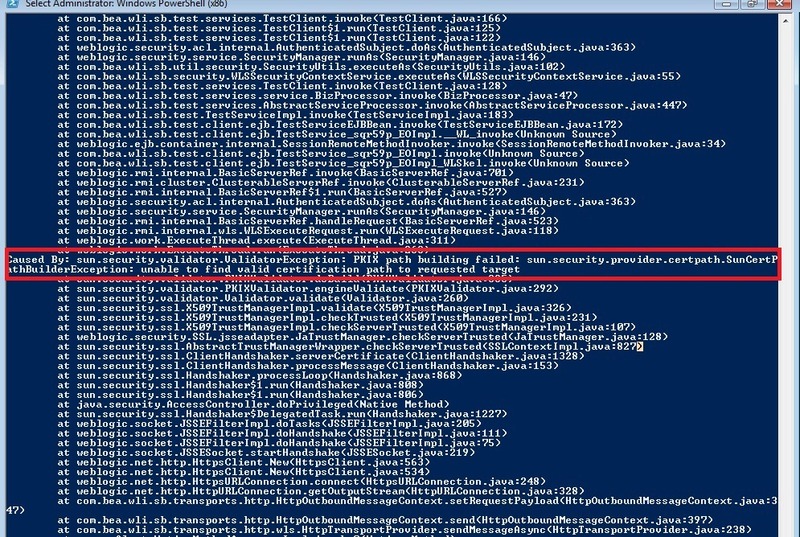 For the first time, jdeveloper is getting stuck saying ‘Loading Maven…’ when opening any existing Service Bus application. 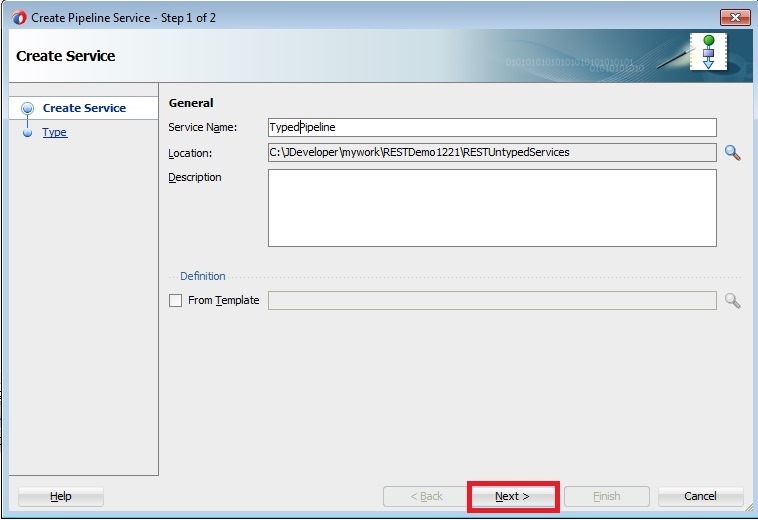 To resolve the issue, modify the version to 12.2.1-0-0 in parent section of pom files of service bus projects including System project. Sample is shown below. 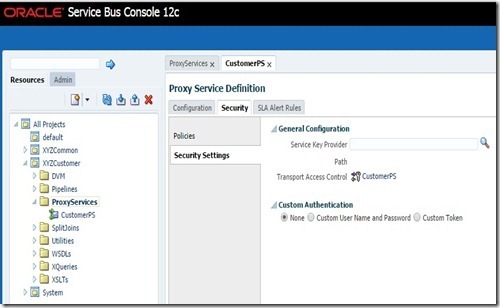 In the last 2 posts, we have seen how to configure Service Bus to use 1-Way SSL and 2-Way SSL. 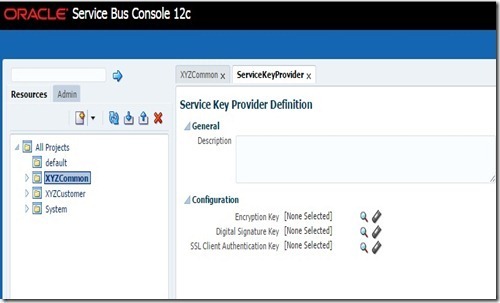 In both of these scenarios, our Service Bus managed server is acting as Server but our server can also become a Client when talking to external services using the Business Services having SSL enabled. 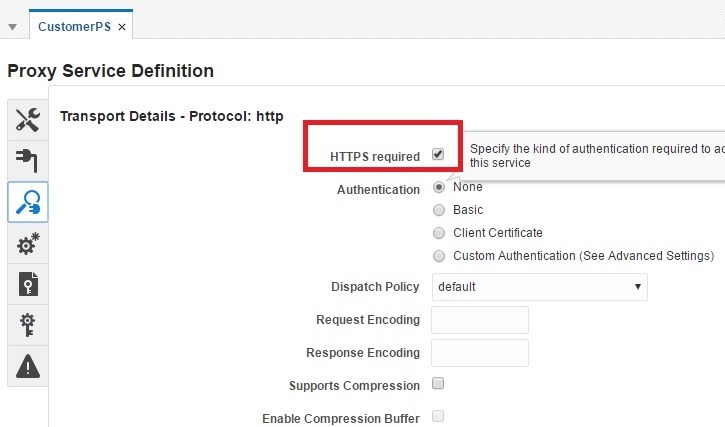 So we will discuss about Outbound SSL in this post. 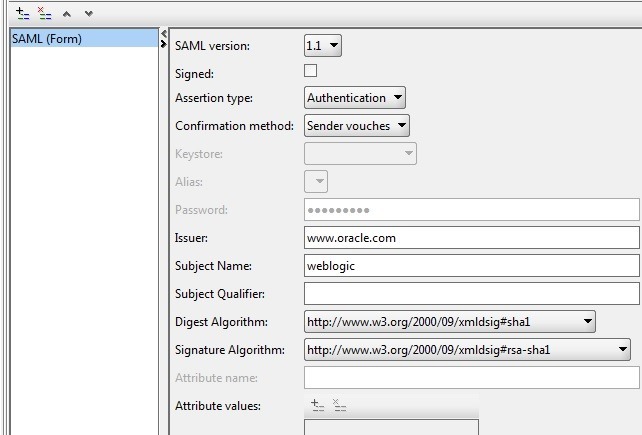 Before getting into the required OSB setup, enable our SOAP UI mock service to use SSL. 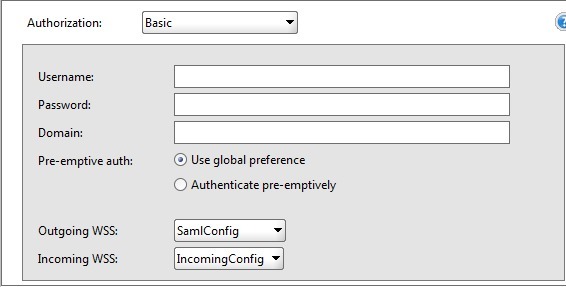 Go to File –> Preferences –> SSL Settings and set properties as shown below. 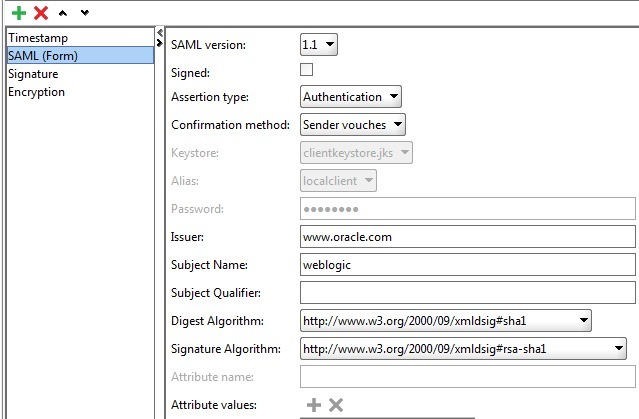 Access your mock service as shown below to confirm that SSL is enabled. 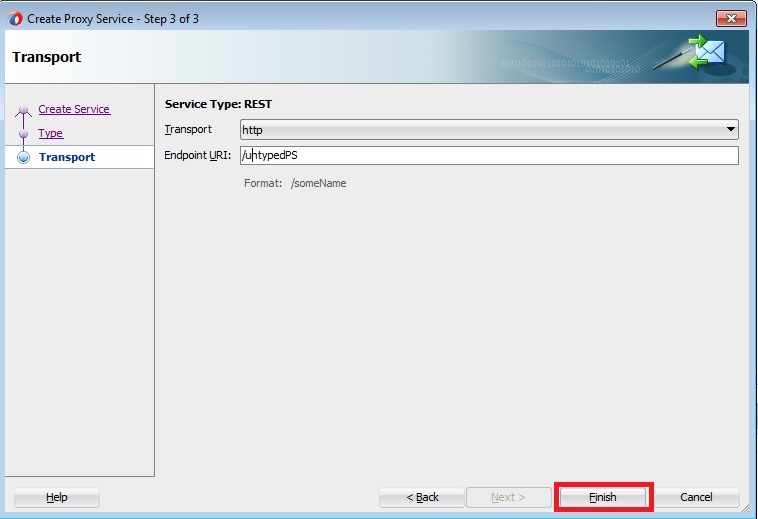 Now update the business service endpoint URI with this URL in the Service Bus Console as shown below. 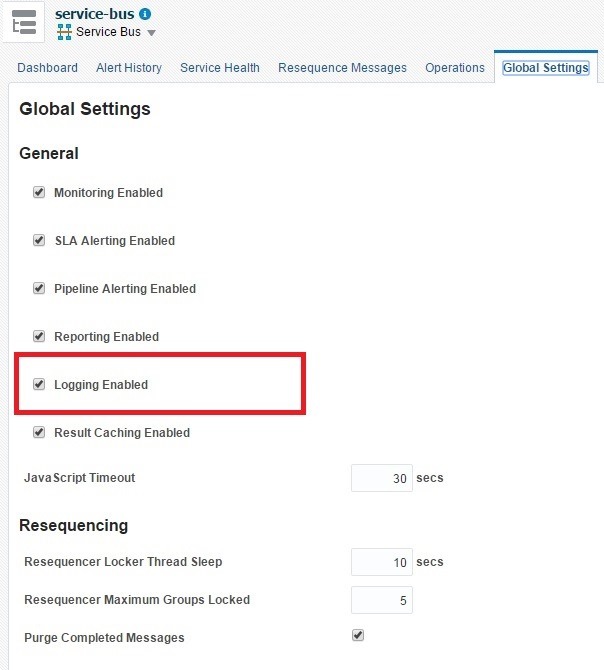 Now test your business service and you can observe following error in server logs. 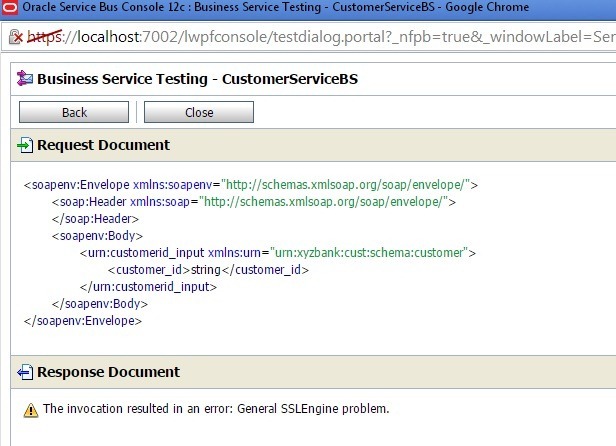 This is because you have not yet updated the OSB server trust store with the certificate of SOAP UI mock service. 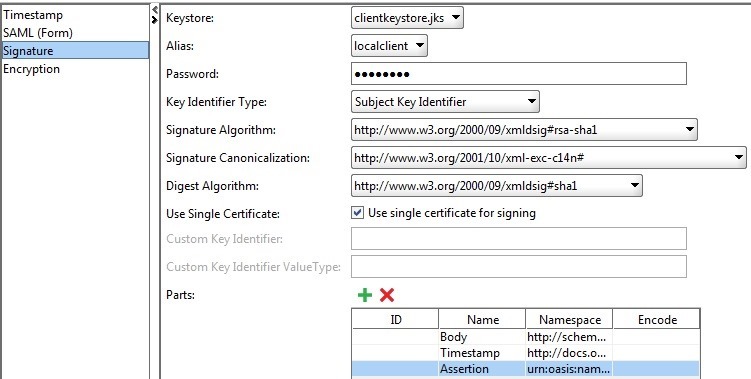 So now export the Public Certificate from the keystore used for mock service and import into OSB trust store using following commands. Now test your Business Service to see the response as given below. 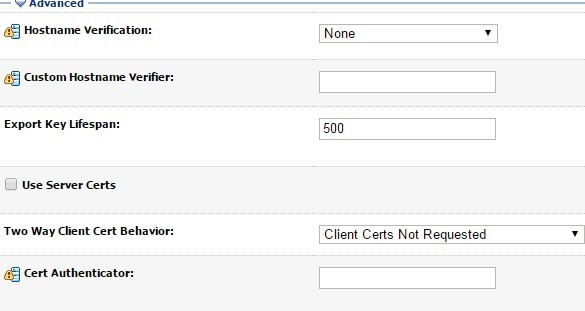 In case of 2-way SSL, our Proxy Service acts as client and need to send the corresponding Public Certificate when server requests(in our case, it’s SOAP UI Mock Service). 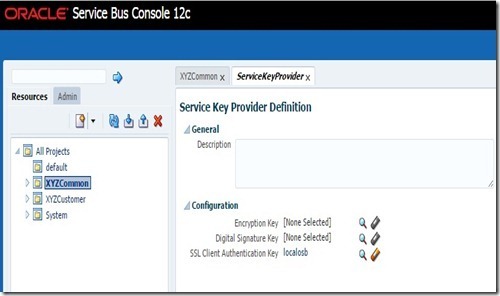 In Service Bus, the resource Service Key Provider is used to retrieve the required PKI credentials that includes Private key paired with a certificate. 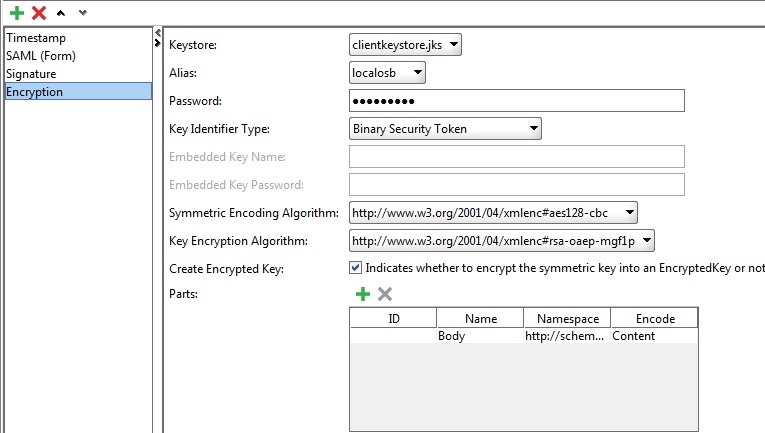 Proxy services use this key-pair to authenticate when acting as a client during an outbound SSL i.e. 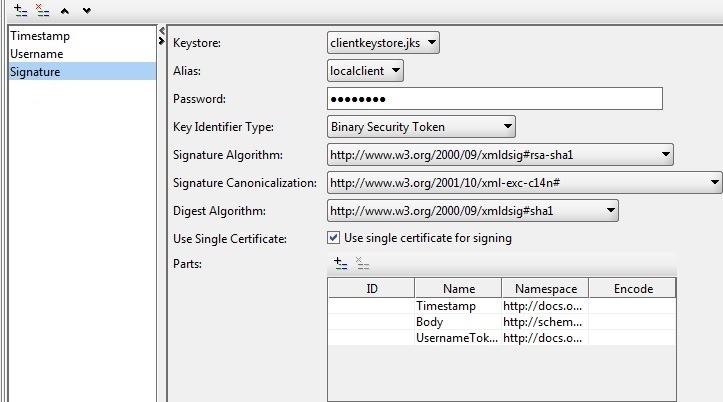 during routing a message to HTTPS business service or proxy service requiring Client Certificate authentication. You can find more information in Service Bus documentation here. 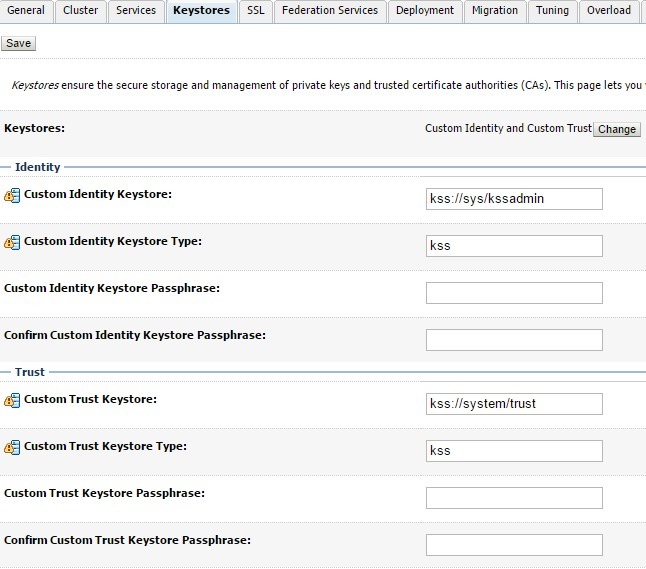 Service Key Provider makes use of PKI credential mapper to retrieve the PKI credentials which has to be created first. 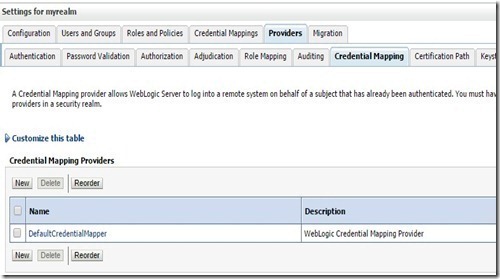 In WLS admin console, navigate to Security Realms –> myrealm –> Providers –> Credential Mapping. Click New. 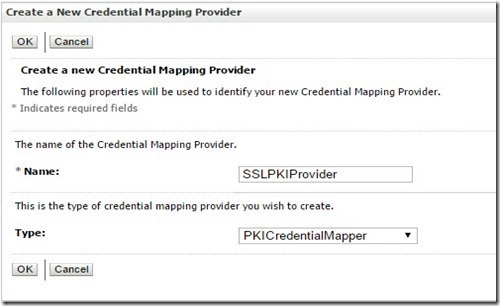 Give name and select Type as PKICredentialMapper and Click OK.
Verify that new credential mapping provider is created. 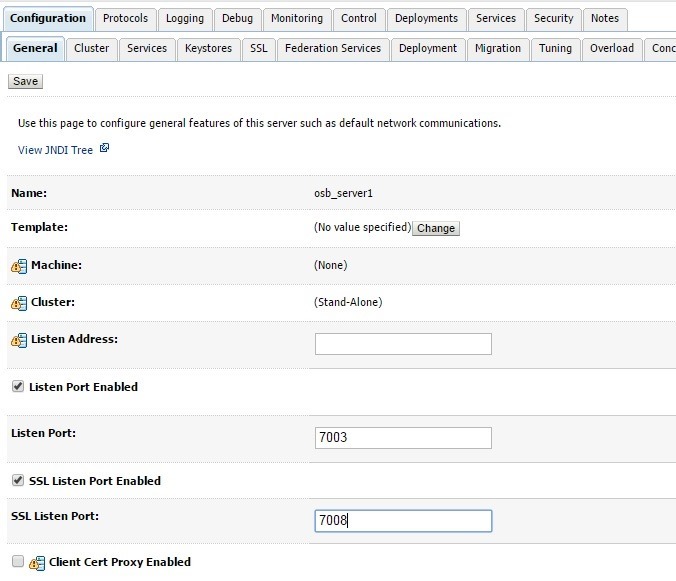 Now click SSLPKIProvider and navigate to Provider Specific tab. 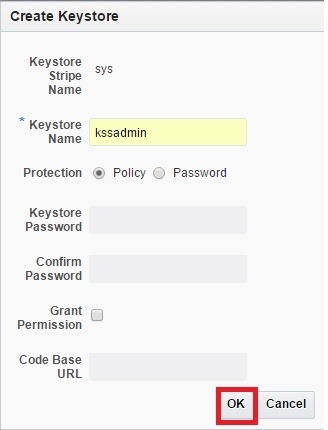 Mention the Keystore and Pass Phrase specific to OSB managed server and click Save. 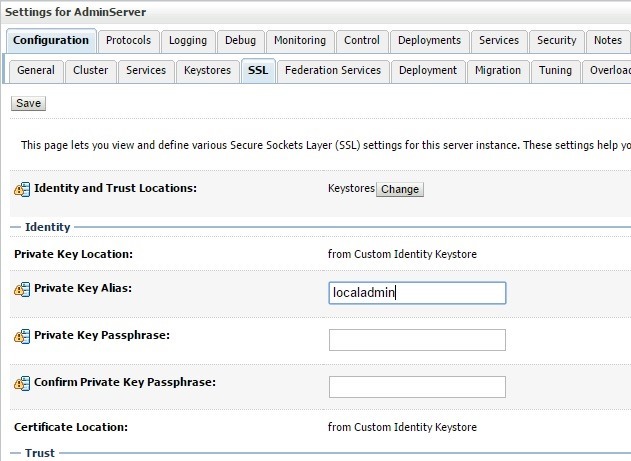 We will directly use the sbconsole for creating the Service Key Provider and to make other required changes for Business and Proxy Services. 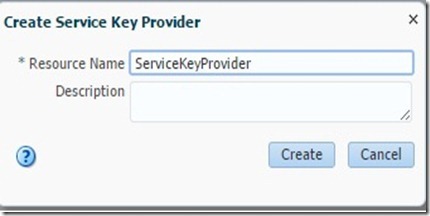 Create a OSB session and select Service Key Provider from drop down menu as shown below once you select the Service Bus Project. 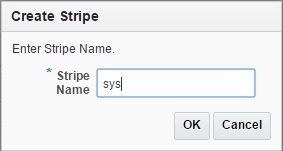 Provide the name and click Create. Now the Service Provider Definition look like as below. 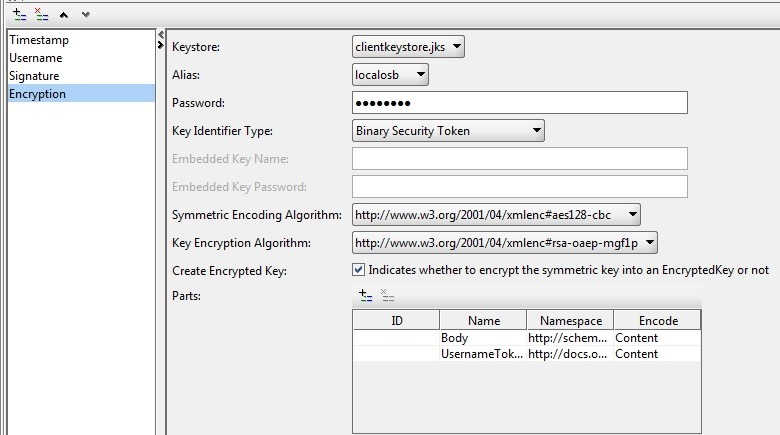 Since we are using this for SSL purpose click search icon for SSL Client Authentication Key. 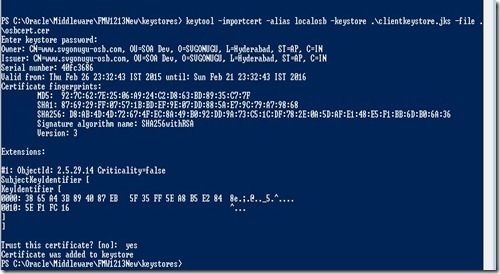 Choose the Key Alias as shown below and provide the password. 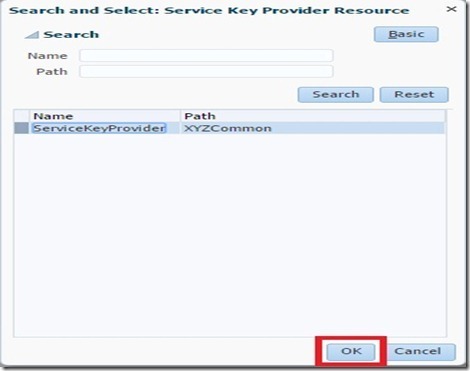 Click OK to bring up following screen and Save your changes done for Service Key Provider. 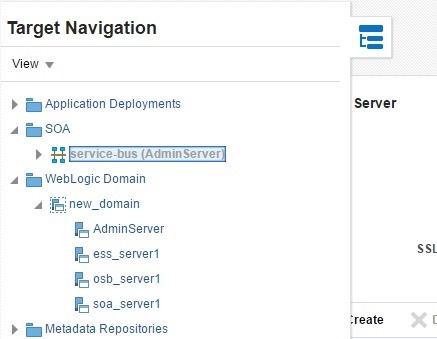 Do activate Service Bus session. 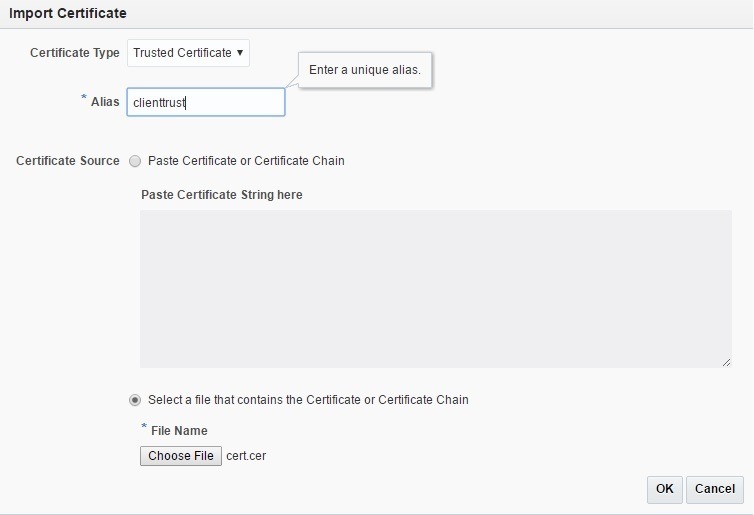 Before proceeding with Proxy and Business service changes, you have to enable the SOAP UI mock service to request for Client Certificate. 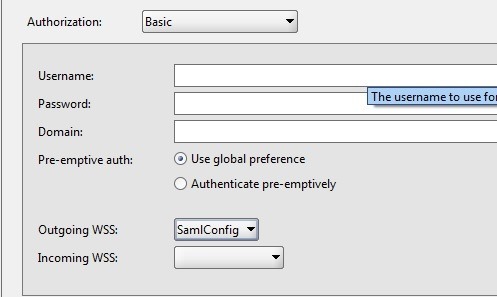 To do this, navigate to File –> Preferences –> SSL Settings and choose Client Authentication as shown below. 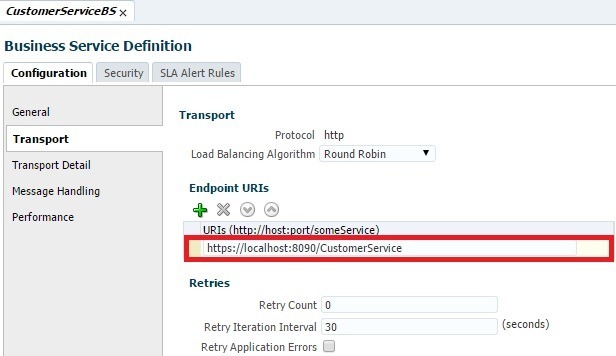 Now test your Proxy Service to observe the following errors in response tab, jetty log and Service Bus logs respectively. 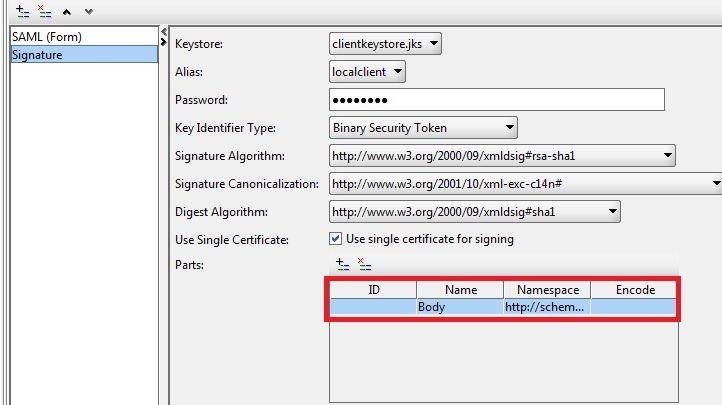 This happens as we have not yet imported OSB server Public Certificate into clientkeystore.jks and also did not configure our Proxy/Business Service to send the client Certificate. 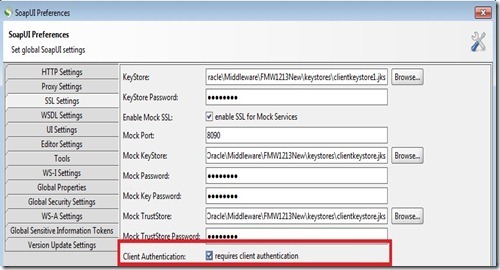 Export OSB server public certificate and import into clientkeystore.jks using following commands. With this, we are done with the SOAP UI settings and let us proceed with the changes required for Proxy and Business Services. 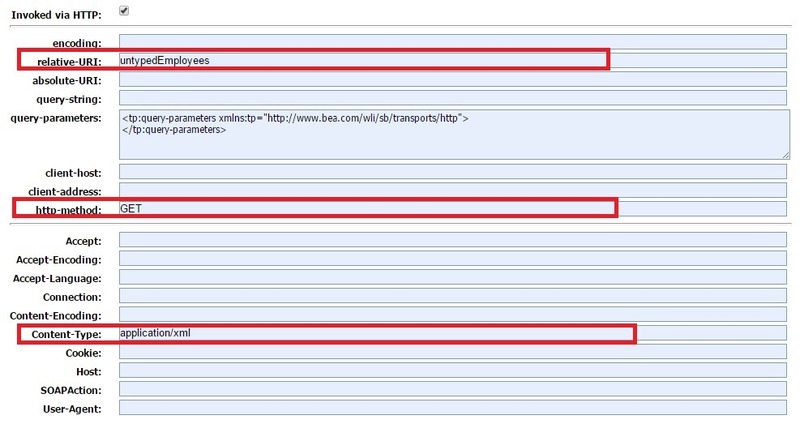 Open business service and navigate to Transport Detail tab. 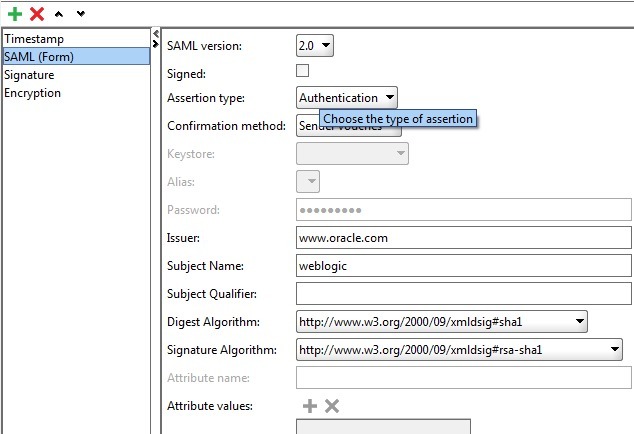 Select Client Certificate as shown below for Authentication and save changes. 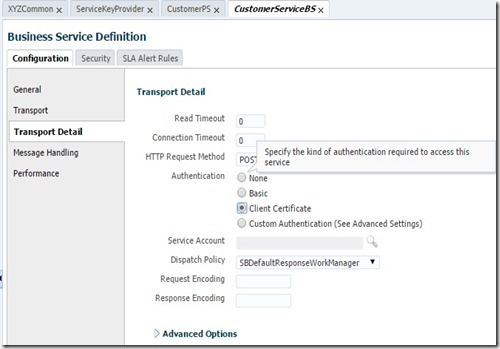 Open proxy service and navigate to Security –> Security Settings tab. Click search icon for Service Key Provider. Click Search and select the one that we have created earlier as shown below and click OK.
Now Security tab should show your selection as below. 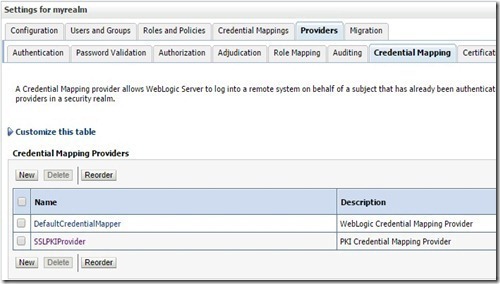 Remember that you have to create OSB session before making changes and need to activate it once your changes are done. You should see successful response as shown below, if you test your proxy service now. Please note that above logs are generated when following JVM options are set in setDomainEnv.cmd file for EXTRA_JAVA_PROPERTIES.